which was called Skidbladnir, in which he sailed over wide seas, and which he could roll up like a cloth. Odin carried with him Mimir’s head, which told him all the news of other countries. Sometimes even he called the dead out of the earth, or set himself beside the burial-mounds; whence he was called the ghost-sovereign, and lord of the mounds. He had two ravens, to whom he had taught the speech of man; and they flew far and wide through the land, and brought him the news. In all such things he was pre-eminently wise. not yet completed lot; and also bring on the death, ill-luck, or bad health of people, and take the strength or wit from one person and give it to another. But after such witchcraft followed such weakness and anxiety, that it was not thought respectable for men to practice it; and therefore the priestesses were brought up in this art. Odin knew finely where all missing cattle were concealed under the earth, and understood the songs by which the earth, the hills, the stones, and mounds were opened to him; and he bound those who dwell in them by the power of his word, and went in and took what he pleased. his priests of the sacrifices, and they came nearest to himself in all wisdom and witch-knowledge. twelve chiefs from Asaland, and called them their gods, and believed in them long after. “Do you see them coming down the road? Here they come. Do you see that tempered man with his worn beard? He has fallen many times in his heart and nearly twice in life.” He brushed the hair from her eyes looking down at her tiny frame. “I see them. And yes, I have seen that mans fortitude.” There was no gold road here to drift along, illuminated by fantasy. But this…this was home. “Look upon them, oh, look! They are coming.” It was as if an eternity had snuck by in one moment, but she knew it had been much longer. The wise traveler knew as well. She looked up at his spear, contemplated all the blood it had seen, how many stains it still had. And yet it worked without flaw, better for those that had benefited its favor. Down the path more were coming. Each with his own rips, tears, and trust. There was family here, they would see. But for now they each remained quiet. For such a multitude, there was no sound. Souls arriving home. A breaking voice would have emerged as a dry scream of uncertainty had it not been for the void of air in their lungs. But you could feel their desire to speak. Some came with the runes engraved into them. Some came with high chins of hardly contained exuberance. And some just simply came. These were the people who in life had been tempered by the great kings who were never great, revered for the sake of reverence. There had been a ritual in the undoing of the masses under a foreign god which continued through centuries until its fallacies began to blaringly leap forth from the pages of an echoed threat with bared and rotten teeth, that not all were any longer waiting to serve. And when that happened, more began to come traveling back towards the roots of Yggdrasil. Towards the well. Towards Asgard. Existence for them, as it were, was finally breaking free – but into what? For some, it came at great cost and much personal loss. Hammered from the inside out to emerge into a free mind only to find it needed filling with a vastness of brilliance that eluded too many. Others that had obtained that expansive brilliant light often lived as paupers among the few in hopes that legacy was as rich as the almighty coin. ** This copyrighted material may be used for educational or reference purposes (such as on blogs, Facebook pages, etc) that are NOT for profit so long as the entire text, with author, is kept intact. Please do not distribute this piece in any other way. New articles for heathen women….and men! The new series of Heathen Woman articles by Heather O’Brien are up on Agora over at Patheos.com. These articles are suited toward supporting and encouraging heathen women but are also appropriate for men – as most of the articles are geared towards living as a modern heathen while conserving traditional heathen practices, traditions and values which apply to both men and women. By following the links below, it’ll take you to each individual article. As always, we hope to see you over at Women of Asatru on Facebook! Ages ago, before the time of technological advancements, people relied heavily on their faith to motivate, heal, and connect to the world around them. There were no means by which to identify with technologically. Today, everything around us is easily attained by the push of a button whether it be a phone call, email, or reading a book. It’s all available to us quickly and on demand. Technology saves us time and money, but it sometimes comes with a price – extending our “to-do” lists and giving us a false sense of connectedness to the world around us. Does technology make it easier to connect with others? Yes. However, we need to also take time to connect with ourselves. With the incorporation of technology came a heavy reliance on it, and quietness began to fade. There was no longer any need to wonder about the cause of something when the answer could be discovered in a matter of seconds. Modern living has made our lives easier, and indeed healthier, in many ways. However, we must not forego our innate sense of wonder, faith, and spiritual connections to the things that are truly sacred to us. It’s important to reconnect with our inner self and nature from time to time. Take a break from the alerts, alarms, phone calls, and emails and get back to nature. Observe the behaviors and sounds of the wildlife. Use your senses to fully experience a life outside of the business of regular day to day life. If you have a religious path, take some time to practice your faith outdoors whether it be through prayer, reading or holding a service outside. Meditation is another great way to quiet the mind and escape the noise for awhile. Breathe deeply, empty your thoughts and let everything go for a little while. It will still be there waiting. The point is to recharge your batteries so to speak, and completely acknowledge yourself for a time. Even turning off the radio in the car and taking a few minutes to observe the changes in your community can help your perspective change from rushed to quiet, and allow you a mindfulness that we sometimes lose. We need to sometimes take a step back and focus on ourselves. Doing this gives us a sense of control back, and a renewed spirit and refreshed body and mind. All parts of the “self” work as a braided chain. If one strand is “out of whack”, the rest are weakened. Getting swamped, overwhelmed, and too wirelessly connected can dull the senses and tune us out more than it tunes us in. Keeping a small notebook with thoughts, observations, goals and future plans can help us also identify whether the areas that are taking up time in our lives match the things that inspire us and make us happy. If not, looking back through those notes can provide new inspiration and act as a guide to any changes that may need to be made in order for us to switch gears and aim our energy elsewhere. Take time, each day, to do something for yourself spiritually. 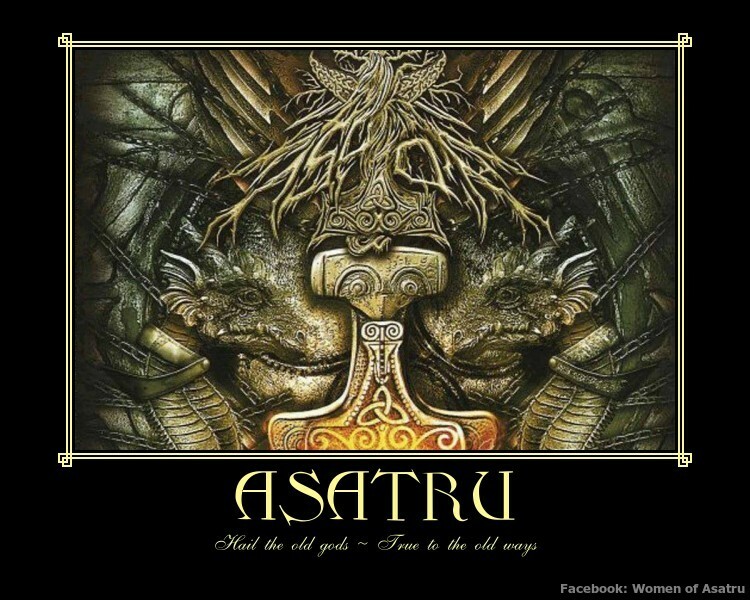 How do I become Asatru? How do I practice Asatru? Simply, there is no organization that you need to join. There are no commandments, though we do hold sacred actions that bring honor to ourselves and we work hard to bring a positive image to the community around us (this includes a personal presence online). Many Asatruars choose to live by a code of honor called the Nine Noble Virtues, which act as a guide to accomplish living by this mindset. A good exercise for those who are new to Asatru, or even longtime practitioners, is to go through the Nine Noble Virtues and make notes of what they mean to you – and which ones you need to work on personally. The Nine Noble Virtues are listed as: Honor, Courage, Truth, Fideltiy, Discipline, Self-Reliance, Hospitality, Perseverance and Hospitality. Again, they are not commandments, they are a guide. 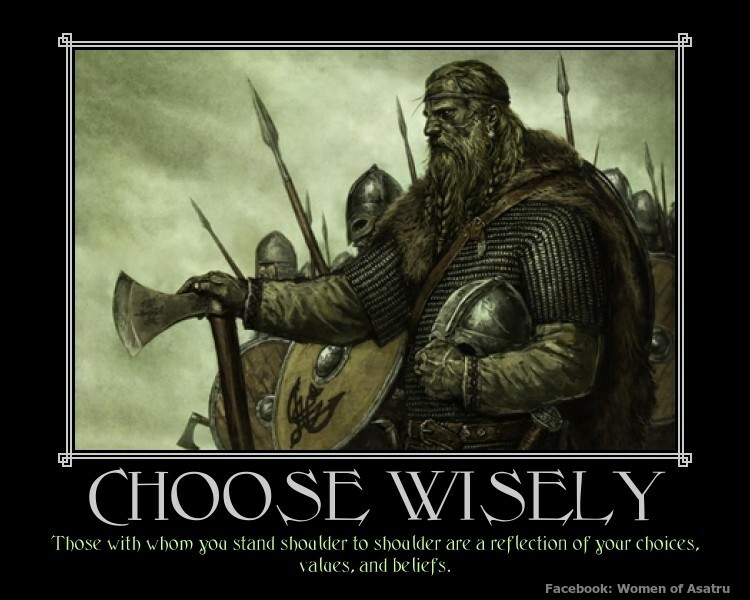 In Asatru, we believe that “we are our deeds” and the outline of these virtues can help us stay on our path. They were originally written down in the 1970’s, adopted from principles and attributes that were found to be those reflected by the gods themselves. The gods understand, and are very aware, that we are humans. We have flaws, independence, our own thoughts, goals, passions, and dreams. Since honor is the foundation on which we base our beliefs and standards, we recognize that we will “mess up” from time to time. When we do, we try to make things right as soon as possible with any person whom we have wronged. We own our actions and do not make excuses for bad behaviors that have landed us in hot water. We accept the price and will work to pay for our misdeeds. This is known as “weregild” – a form of repayment for a crime against another. Weregild is usually equal, or greater, in value to the misdeed committed. Asatruars try their best not to leave mistakes unresolved. While there are no absolute texts to read, a good place to start is with the Prose and Poetic Eddas. Originally written and translated by Snorri Sturluson, the Eddas are written based off of oral lore about the gods. Snorri was a Christian, and though he tried his best to accurately reflect these stories it is doubtful that he was able to do so in a completely unbiased way. Years later, the Norroena Society spent six years with thirty scholars to go back through the Eddas and remove the Christian influence that was found in Snorri’s translation, and composed “The Asatru Edda: Sacred Lore of the North” that kept the Proto-Germanic originality intact. It preserved the lore while restoring the original tone that would have been used by the Germanic people at the time they were given. Whatever translation you choose, and there are many, reading the Eddas provide insight into the lore that explains the attributes, details, and history of our gods. From there, you can choose from a variety of books that appeal to you on the subject of lore, runes, seidr, Norse culture, Norse mythology, and folk traditions. Many books exist both in pdf format and online for purchase. Take a moment to review our “Bibliography” tab at the top of the site for a few starting ideas. You do not need to be proficient in using the runes to be Asatru. Learning the runes is a process that takes some people years, or even a lifetime, to study and grasp. If you feel a call to study them, do it, and trust your intuition. Study them at a pace that is comfortable for you, and it can be helpful to seek out a mentor that can direct you. We call rune experts Vitke’s (pronounced Vit-key). Having an experience mentor can provide you with an ear of understanding and help encourage you along the way, as well as provide a valuable resource for continued learning. Read through our site about the holidays and traditions we celebrate (these can be found in the tabs at the top of the page). You will also find information on holding a blot – a sacred time that we use to honor the gods and give thanks to them. Get to know the gods by reading their stories and meditating on them. Draw on the lore for study purposes, but also put time into your thoughts about what those stories mean to you personally. Do you see strengths and weaknesses that you can relate to? Do you feel a particular “call” from a certain god? Meditating on each of them can help answer those questions. Don’t feel rushed, and always proceed at your own pace. A note on Folkish vs Universalist: It is not necessary to pick a side so to speak. You, and everyone else in the world, should be proud of who they are and wherever they hail from. Purple, black, white, green, antennas, polka-dots, dark, light, etc.. Your ancestors fought and worked so that their family line could continue – which resulted in YOU being here at this time and place. Be proud of them. Be proud of you. Some people use the words “folkish” or “universalist” to separate themselves into categories. Our virtues are our virtues. Our guidelines for living are fairly straightforward. If you commit yourself to a life of living honorably and making a positive contribution to yourself, home, and community then you are following the principles that are set forth in Asatru. No matter which religion someone claims, there is never a reason to degrade, shame, or otherwise be a jerk. No one is perfect. We are all eternal students in life until the day we die. This is known as “the human condition” and it is one that should be kept in mind. If we believe in freedom, we must actively work to pursue and endorse it. Not just for some, but for all. 1) Are they contributing to Asatru in a positive way? What are they doing in the Asatru / Heathen community both online and in the “real world”? 2) Is there drama that they are causing? Don’t get sucked into someone’s personal issues. 3) What are their credentials? (send them a message and ask). Get to know the creator and admins of a site. Anyone that is teaching Asatru should be eager to answer your questions in a way that is both welcoming and informative. If their material on their page seems incomplete, or unreferenced, it should be a red flag. Reputable teachers of a faith, history, traditions, and the lore have spent years studying and learning. They may not have all the answers to your questions, but the answers they do give should sound verifiable, complete, and truthful. 4) What am I learning, or exposing myself to on this site? Does it reflect Asatru principles and virtues? Asking these questions will help you avoid those who have a personal bias, political agenda, or otherwise are misinforming or making a mockery of our faith and virtues. It’ll also save you headache and time later on. You do not need to be a member of a kindred or hearth. Kindreds can be an awesome, and powerful, way of connecting with others that share the Asatru faith. They can provide family, friendship, and personal bonding that is unlike any other connection. However, there may not be a local kindred in your area, and that’s alright. You can find a group of like-minded heathens to get together OR you can choose to remain solitary in your faith. Either is fine, it is the intent and coming to the gods to honor and thank them that is most important. If you have any other questions, please feel free to drop by our Facebook page, Women of Asatru, and send us a message. We try to respond to all questions and inquiries within 24 hours so don’t be shy. We’d love to meet you! Today’s ‘Daily Lore’ comes from the Voluspa. This passage reminds us an important note that Havamal speaks of: speaking mindfully. The greatest thoughts, the most ingenious inventions, and attuning to our higher self begins with first being silent. Quieting our minds, and being careful of the words we speak, changes our perceptions of how we view the world around us and what is truly important. Speaking words of value allow others to form a trust in what we say. They will eventually come to realize that we don’t aimlessly spout off at the mouth any time we want, but rather put thought behind what we say. Ancient tales of the world, the oldest I remember”. The Seeress in this passage calls for complete silence, a common practice among leaders. Tacitus wrote (in reference to the Thing): “When the assembled crowd thinks fit, they take their seats fully armed. Silence is then commanded by the priest.” He compares reverence and silence to being “fully armed”. This is when we have our wits about us most, able to listen and participate mindfully, which is an open door for deeper learning to take place. Take time today to quiet the mind. Turn off the phone, get away from the daily distractions for just a few minutes. Breathe deeply and make a conscious choice to guard your words and deal with things one step at a time. I’ve included the link about to a great manual regarding the various parts that are involved in practicing seidr. This is a fairly comprehensive, and easy to read, manual that can be downloaded and printed for reference. Would make a GREAT addition to a study notebook! I have read the book “The Asatru Edda: Sacred Lore of the North”, written by the Norroena Society, now twice. The first time, I read the physical copy and then installed the Kindle app version on my phone. I have to say, the highlighter feature on the Kindle app was a blessing while reading it a second time! There is so much detail in this translation of the Poetic and Prose Eddas, that without a highlighter it’s hard to keep up with it all. PLUS!! There’s a free study guide that can be found on their website. That’s very helpful when you’re studying the Eddas for the first time, or the seventeenth. Breaking it down can help really gain a deeper understanding of the lore and makes it appropriate for study groups as well. I’ll attach a link to their website at the bottom of this post. If you click on their archived posts, you’ll find even more in-depth reviews into various gods and relevant concepts. I have looked over their site and found no personal agendas, profit seeking, or otherwise unsavory content. What makes this translation different? In addition to the detail, it was written over six years by thirty scholars who were determined to go back to the Proto-Germanic language and keep it’s tone and meaning intact. In other words, there is no Christian influence. They used the original language to translate the Eddas rather than writing yet another translation based on Snorri’s original works. While I appreciate the work that Snorri put into writing the Poetic and Prose Edda, he had his own personal influences that can clearly be seen in his works. Personally, I would rather have the meaning and translations as close to the original as I can. There is a lot of the same information, and there is a lot (A LOT!!) of detail that is not in Snorri’s translation, or subsequent ones based off his original works. The author, Mark Puryear, has also written other material that we’ll review at a later date. I have found his writing to be both thorough and educational – suitable for students of the lore or those interested in learning more about Asatru. Both The Asatru Edda: Sacred Lore of the North, and other books by Mark Puryear, can be found online and in many bookstores. If you’re reading, or have read this book, let us know what your thoughts are. Also, we’re always looking for new great reads so feel free to make recommendations! Keeping the various halls of the Norse gods in order can be tricky, so I’ve put them all here alphabetically along with the deities that they belong to. I think this would make a good addition to a study notebook as a quick reference sheet. Bilskirnir ( means ‘Lightning Crackle’) and is the hall belonging to Thor. According to the Grímnismál, Bilskirnir is the largest of buildings and contains 540 rooms. Bridablik ( means ‘Broad gleaming’ or ‘Broad View’) and is the hall belonging to Baldur. Described in the Gylfaginning and Grímnismál as being a place where nothing unclean can dwell. It also said to “have the fewest baneful runes” and nothing evil may enter. Fensalir ( meaning ‘Fen Lands’ or ‘Sea Halls’) and is the hall belonging to Frigga. Mentioned in the Poetic Edda, specifically in the Völuspá, scholars have theorized that Fensalir may been the location of various springs and swamps or even perhaps the sea. Fokkvang ( means ‘field of the host’ or ‘army-field’) and has also been called “the field of warriors”. It belongs to Freyja and is said to contain nine castles. Her home lies within a meadow presided over by her where half of those who die in combat go upon their death. The other half go to Odin to reside in Valhalla. In Freyja’s hall, the dead are catered to by faithful wives and women who died before marriage. Fólkvangr is mentioned in the Poetic Edda where Freyja’s hall Sessrúmnir (‘the many seated’) stands. In the Grímnismál it states: “The ninth is Folkvang, where Freyja decrees, Who shall have seats in the hall; The half of the dead each day does she choose, And half does Othin have.” (Henry Bellows translation). Gladsheim (means ‘Bright or Radiant Home’) and is a realm in Asgard that belongs to Odin’s Valhalla. Mentioned in both the Grímnismál and Gylfaginning, Gladsheim contains a meeting hall with 13 high seats where those of the high council of Asgard hold their meetings. Glitnir (means ‘Shinning Hall’) and belongs to Forseti, the Norse god of law and justice. This is where legal disputes are settled and conflicts resolved. 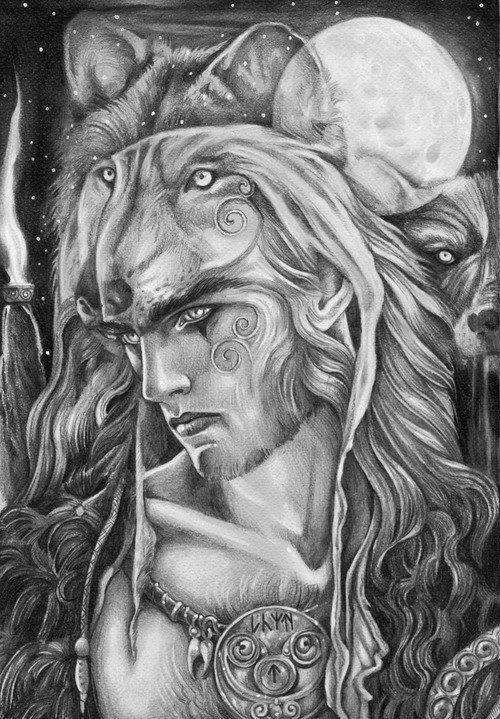 It is also attested to having been a home to Baldr, Forseti’s father. Glitnir is described as having pillars of red gold and its’ roof being plated in silver. Landvidi (meaning ‘White or Wide Land’) belongs to Vidar. The hall is said to have tall branches, fresh flowers, lush vegetation and high grasslands surrounding it. It is the picture of solitude and all that is naturally beautiful that comes from the earth. Vidar is the symbol of regrowth and sustainability and will be there to avenge Odin in the final battle. Noatun (means ‘Ships Enclosure’) and belongs to Njord. Noatun is mentioned in the Poetic Edda as being located by the sea, and fishermen and explorers alike would ask Njord for success on their expedition and protection from the strong winds. Sokkvabekk (means ‘Sunken Bank’, ‘Sinking Brook’, or ‘Seeress’) and belongs to Sága. It is said to be a place of cool flowing waves where Odin and Sága sit and drink. There are some scholars who propose that Sága may be the goddess Frigg and that Sökkvabekkr could be a connected source to Fensalir since both are described with the same attributes. In the Poetic Edda, the Grímnismál states: “Sökkvabekk is the fourth, where cool waves flow, And amid their murmur it stands; There daily do Othin and Saga drink, In gladness from cups of gold.” In the book Skáldskaparmál, Sága is listed as being present among a list of 27 ásynjur but no further information is provided. Jacob Grimm theorized that the drink shared among them was the drink of immortality and that Saga could be described as a wife or daughter of Odin, leading further scholars to believe that she is Frigga or perhaps a Norn / Schöpferins (shapers of destiny). Thrudvangar (‘Power Field’ or ‘Power Plain’) the land that belongs to Thor and his Hall Bliskirnir. Mentioned specifically by King Gylfi in the Gylfaginning, it is described as being the largest of buildings ever erected and recounts the story of Thor returning there after the völva Gróa unsuccessfully attempted to remove the stone lodged in Thor’s head after his battle with Hrungnir. Valaskjalf (‘The Shelf of the Slain’ or ‘Hall of Silver’) is one of the halls belonging to Odin. Valaskjalf is an adorned building roofed with silver. At its’ pinnacle of Valaskjálf is Odin’s seat called Hlidskjalf from which he watches all that takes place in the Nine Worlds. Reference to it can be found in the Poetic Edda, specifically the Grímnismál. The hall is also said to be the home of Vali who is a son of Odin and is said to survive Ragnarok which may mean he will dwell in Odin’s high seat after the battle. Vigrid (means ‘battle-surge’ or ‘place of battles’) is the plain in Asgard where the final battle will take place. It is mentioned in the Poetic Edda briefly, but the Prose Edda gives a more detailed account of the battle that will take place between the gods and forces of Surtr, as part of the events that will occur during Ragnarök. Vigrid is said to stretch 100 leagues in every direction as mentioned by Odin (disguised as Gagnradr) in the Poetic Edda poem Vafþrúðnismál. Vingolf (meaning ‘Wine Hall’ or ‘Friendly Door’) is the hall and sanctuary belonging to the Asynjur. This hall is specifically mentioned in three places within the Gylfaginning, in the Prose Edda: “All righteous men shall live and be with him where it is called Gimle or Vingolf, but wicked men will go to Hel and thence to Niflhel (abode of darkness), that is down in the ninth world. (Young’s translation). Another quote from the poem is: “Odin is called Allfather because he is father of all the gods. 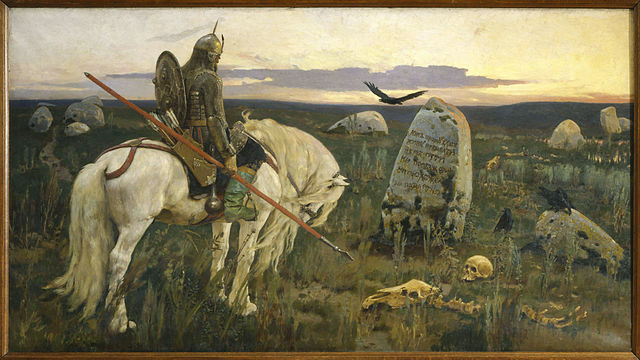 He is also called Father of the Slain, because all those that fall in battle are the sons of his adoption; for them he appoints Valhall or Vingolf, and they are called Champions.” (Brodeur’s translation) Vingolf may be a comparable term to Gimle, the paradise where the righteous go after death. Ydalir ( meaning ‘Yew Dales’) is the hall belonging to Ull / Ullr. Ullr was the noble archer god and around his hall grows the tall yew trees that provide the wood that is needed to form all of the bows. Described in the Poetic Edda, Odin (disguised as Grimnir) tell Agnar: “Ydalir it is called, where Ullr has himself a dwelling made. Alfheim the gods Frey gave in days of yore for a tooth-gift”. (a tooth-gift was a gift given when a small child cut their first tooth). The Eddas also speak about Ull stepping up into a position of leadership in Asgard during Odin’s absence for ten years.